Four times a year, close to the sun festivals of solstice and equinox, Mid Wales Forest Church has a 'Ritual', which is a grand name for what might be better described as interactive, experiential, shared meditation / reflective / alternative-worship like activities. Ritual is shorter. We’ve drawn and walked a labyrinth on a beach, explored earth and womb metaphors in a small disused quarry, told stories about ancient centurions and treasure as the mid-winter sun set whilst stood in the remains of the roman outpost. I thought the devising process behind these kinds of events may be of interest to people getting involved in Forest Church. Here is how (and why) I do it the way I do ... as it happens. As I’m writing this first part, the event has not yet happened, nor have I arrived at an idea of what I’m going to do. There are a number of parameters that exist before I start that already shape whatever I’ll eventually do wherever I do it. It can help the creative process to be clear about what these are and equally clear about what is still free and undecided. In the spirit of my ‘alternative-worship’ background, I make it a habit to question any givens and I don’t feel compelled to follow any particular prescriptive patterns of worship from any tradition although I can draw on these if they’re appropriate. Here are some of the starting points. The time of year is an important parameter. It will be the event for spring equinox so that already suggests some themes around balance. Lent and spring are also rich with themes which I may or may not tap into. The participants come from a wide range of spiritual backgrounds and paths so I’ll keep what I do as open and inclusive as possible. My favourite events are like compelling stories, instead of prescribing a particular response they allow the individual participants to select their own level of involvement. I personally prefer not to use paper, which seems to create a barrier between us and nature, or follow a ‘service’ model partly because that model isn’t my creative strength or passion. But I do value liturgy (because it focuses people together quickly and takes that focus deeper) and shared responses, so this is a creative hurdle to overcome. A core ingredient of any Forest Church event needs to be nature connection and participation, so the idea must allow this to happen. At the very least this might mean building in space, but more so it means allowing the idea to be flexible enough to move with whatever happens during the event, to make space for Gods Spirit in the place to speak. I also want in find some subtle way to express something of my own spiritual tradition through the content or structure of the event. With the parameters above, in the background, the real starting point is a visit to the location with an open mind and a blank canvas. It may be that I have a location in mind from a previous visit or I may be meeting it for the first time but I always go sometime in the week or two before the event to spend time there. I may write another post about how to meet a place for the first time as there are some techniques and exercises that can help. For this 2014 spring equinox event I didn’t have a location in mind but as the event got nearer the bronze-age sunken forest at Ynyslas began to occupy my thoughts. The problem we have to overcome with our rituals is that we also share a celebratory meal at the event and the third Sunday in March is challenging if we insist on trying to do this outside. In 2013 it actually snowed during the event which was fine as we retreated indoors for the meal. At Ynyslas there is no indoors. So, a few days ago I made a visit to the site to coincide with low tide. The violent storms over the winter had revealed more of this lost forest as the peat that protects the remains was washed away. By the time I found the right place the neap tide was beginning to cover them – I had about 40 minutes to connect with the place with a view to absorbing as much sensory and intuitive impressions as I could and also trying to drop any unconscious preconceived ideas I may have carried in with me. Many places have pre-existing stories, legends and interpretations associated with them but I often find these differ a lot from the sense given by the place without that distraction. To meet someone or a place, as if for the first time, with no preconceived ideas AND to give them / it your full attention is a deeply loving and respectful act and is really the only way to experience an authentic connection. 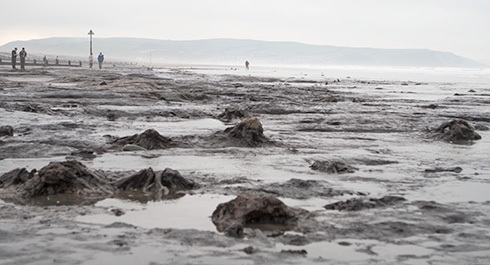 As it happens, the sunken forest at Ynyslas does have a legend behind it of a lost kingdom which I deliberately haven’t researched at this point in the process. Equally I don’t want to pull off the shelf anything prescriptive about spring equinox or lent. This season, at this place, has much that is unique. What about the visit? It was, for me, a strongly evocative place. Very powerful and memorable but also subtle. You could meet these 5000 year old remains and after a few minutes, for lack of knowing how to engage further, move on to the next stimulus, a bit of work is needed to explore and listen. Below the obvious, surface impressions are the deeper ideas it seems as if, the place is saying itself – which may ruminate in you long after you leave. I made some notes while I was there. At first I simply looked around at the remains to see what identifiable parts of trees were there and also absorbing other sensory impressions such as the feel of the peat surface under my feet. My first thoughts were about the age of the place and the effects of sea level rise over the last 10,000 years. I wondered who lived here, who knew this forest and the bears and wolves and boar that also roamed here. Sadly the megafauna would have been long extinct by this time. I wondered about the types of trees and their size and spacing which hinted at a young, successional woodland, not a stand of ancient giants. 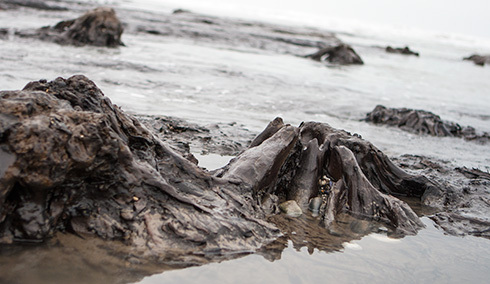 I also thought about the sense of covering and uncovering both at the scale of thousands of years with the peat and the daily covering by the tides – which also spell the second and final demise of these exposed trees. The idea of hidden worlds came to mind and I began to let the place tell me more, to speak its story. What did it feel like? The words muted and buried came to mind and the sense that it was uncommon for it to be uncovered, like there was life and a way of being hidden under the dark cloak of peat that it had gotten used to. So, that is where I’ll leave this first part before I turn my thoughts to what to create for the event. I’m not in any panic to arrive at an idea – it’ll come when it is ready. During the days leading up to the event one idea seemed more important than the others and that was to find a way for the participants to encounter this phenomenon as powerfully as possible without anything prescriptive from me. The best way to do that was to visit it as individuals but prepared in such a way (as explained above) so as to engage with the depth of meaning possible rather than (mentally, sensorially, emotionally) bounce off it for lack of a way in; I wanted to prime people first. So I decided it was perfect opportunity to develop an idea I’ve been mulling over for some time, the environmental or nature connection version of Lectio Divina. I’ll write about the exercise, Sensio Divina, in a separate post. The weather stayed kind to us and the wind was warmer than expected. 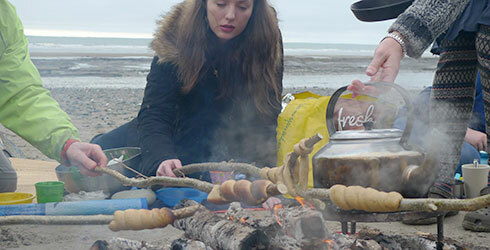 We met on the beach a 100 m or so from the forest and people helped carry food and driftwood over to our spot. When everyone had arrived we began by forming a circle. I then spoke some liturgy that we’ve been using for our solar festivals for a year now. It is short, a little like a simple night prayer, that I hope, in time, people will learn and use to focus. It includes sections that change to make it site specific and it has a central section which is the main event, meditation or exercise – in this case, my unveiling of the Sensio Divina exercise. I explained how to carry out the exercise and breaking my rules about paper, gave everyone a postcard with further notes or instructions on should they need help. And then off people went at their own pace with the idea that we should all meet back around the fire to share any reflections. This was followed by closing liturgy. And we moved onto our shared meal which featured pinnebrød, a treacle sweetened scandinavian rye and spelt bread. As at many of our gatherings, people sometimes stay for a long time which must be a sign that we’re doing ‘church’ right. 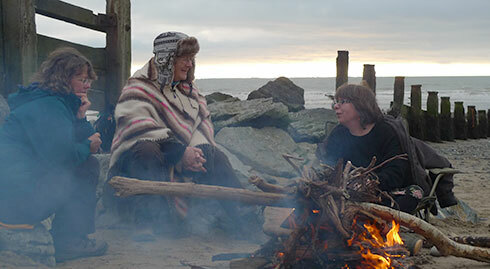 A small group of us were there at the end as the tide just about reached where we were still talking around the fire. See below, with the forest visible in the background of the second photo. Very inspiring! Is one of the problems with doing Forest Church in a more urban setting simply the numerous levels of meaning and history which human activity has created in these areas, and which are impossible to escape? This is especially true in ancient cities like St.Albans. Makes me want to explore some areas around the city where the resonances are less dense, for future St.Alban’s activities. Thanks for your comment Barbara. It’s very tricky to find any actual wild in the UK – much as I like landscape reading and understanding nature it does make you realise that we’ve shaped almost every last inch. The totally barren uplands I live in in Mid Wales are as man-made as anywhere, with the help of sheep, so the coast is often somewhere closer to unspoilt.